Gall stones are hardened stone-like bile formations. Bile, which is produced in the liver, is stored in the gallbladder. This bile is created in order to help the body digest fats. When a person consumes a meal that includes fats the gallbladder pushes the bile into the small intestines where it goes to work breaking down the fat molecules. Bile can turn to stone when the makeup of the liquid contains too much cholesterol, bilirubin, or bile salt. Scientists do not known why the bile produced in the liver can contain too much of one item, like cholesterol, bilirubin, or salt, but they do know that this unequal balance can lead to hardening. They have also been able to pinpoint some other factors that lead to the formation of gall stones, or at least increase the occurrence of gall stone formation. Obesity can encourage the formation of gall stones because the condition reduces the amount of salt on bile, increases the amount of cholesterol present, and leads to the slower emptying of the gallbladder. On the other hand, rapid weight loss can also encourage the formation of gall stones because the rapid metabolism of fat triggers the release of more cholesterol in bile. Fasting also has this effect and can induce excess cholesterol production and reduced gallbladder function. Increased estrogens in the body, either as a result of pregnancy or hormone medication, can also lead to increase in cholesterol levels in bile and a decrease in the speed of gallbladder emptying. 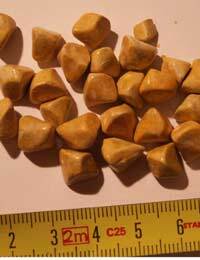 Diabetes can also increase the occurrence of gallstone formation. An increased level of triglycerides, also known as fatty acids, normally associated with diabetes also increases the risk for gallstone formation. Finally, age, gender, and ethnicity, seem to factor into the formation of gall stones. Elderly people are more likely to develop gall stones than younger individuals. Women are also more likely to suffer from this condition as men, and native Americans are the most susceptible group to the this condition. There are two main types of gall stones that can form in the body- cholesterol stones and pigment stones. Cholesterol stones are the most common form of gall stones and are made up of hardened cholesterol. These stones can block the flow of bile through the digestive system, which leads to pain, inflammation, and the impairment of organ function. Pigment stones only develop in individuals who suffer from other conditions such as sickle cell anaemia, cirrhosis, hereditary blood disorders, and biliary tract infections. The exact cause of these stones is unknown but doctors believe their formation is encouraged by increased amounts of bilirubin in the body. Anyone with symptoms of gall stones is encouraged to see their doctor right away. If left undiagnosed and untreated these stones can block the pathways of important materials and interfere with proper organ function in the body. Since the symptoms of gall stones are somewhat difficult to diagnose alone doctors will rely other tests to make an accurate confirmation. The most common diagnostic tools used to diagnose gall stones are ultrasound, computed tomography (CT Scan), cholescintigraphy (HIDA Scan), and endoscopic retrograde cholangiopancreatography (ERCP). Ultrasound is used to locate gall stones. This procedure relies on sound waves to detect and locate gall stones and other abnormalities. CT scans can be used to look at gall stones in greater detail or pinpoint complications form the gall stones. HIDA scans are used to pinpoint gallbladder obstruction or to monitor the contraction of the gallbladder. ERCP is a procedure that requires the use of an endoscope. This scope is swallowed by the patient and is connected to a computer. The doctor uses the image produced by the tube to locate the gall stones and even remove the stones that are blocking ducts. Once gall stones have been confirmed the proper treatment can be ordered and began. The most common way to treat gall stones is to surgically remove the gallbladder. The surgery is called a cholecystectomy and the most common form is a laparoscopic cholecystectomy. This type of surgery is less invasive and leads to less side effects and complications. For the procedure tiny incisions are cut in the abdomen so that surgical equipment can be inserted. Once the gallbladder is separated from the liver and ducts the cystic duct is cut, the gallbladder is removed from the body thus stopping the formation of gall stones. Although a laparoscopic cholecystectomy is the most common treatment for gall stones there are some instances when the surgery is unadvisable. Individuals who suffer from other medical conditions that could seriously complicate the surgery –like blood clotting disorders- or who take medications that could interfere with the healing from the surgery are usually advised to try a non-surgical treatment first. There are two types of non-surgical treatment used to treat gall stones: oral dissolution therapy and contact dissolution therapy. These two therapies are only used to treat cholesterol stones and involve the use of a drug to dissolve the gall stones. For oral dissolution the drugs the drugs, which are made from bile acid, are taken by mouth for a period or months or years until all of the stones are eliminated. For contact dissolution the drugs are injected into the gallbladder and the stones usually disappear within one to three days.